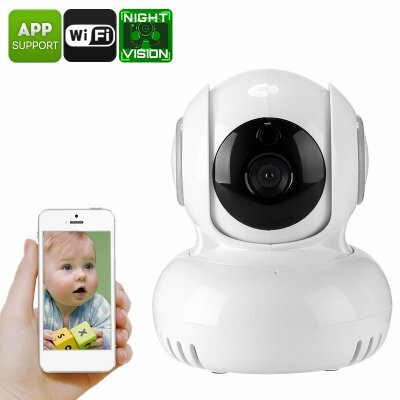 Successfully Added Indoor IP Camera - 1/4 Inch CMOS, PTZ, Remote Access, Motion Detection, IR Cut, Night Vision, 60-Degree Angle, WiFi, 720p to your Shopping Cart. Keep track of all what’s happening at your home when you’re not around with this indoor IP camera. Thanks to this security camera, you’ll be able to leave your house with confidence. From now on, you’ll always be able to check what’s going on at home without you needing to be physically there. Thanks to its WiFi support, this wireless IP camera lets you access its live view via your smartphone. This means that no matter where you’re at, you’ll always be able to access your camera remotely. With its small and compact design, this indoor IP camera can be efficiently placed anywhere in your home or office. Simply connect it to your WiFi, sync it with your phone, and you’ll be all ready to go. With its 1/4 Inch CMOS sensor, this security camera treats you with crisp 720p HD footage. It furthermore supports a 60-degree viewing angle. This provides you with a great overview of all that’s happening in your room. By supporting PTZ, you’ll even be able to turn your camera around in any direction via your smartphone. Like this, not a single spot in your home or office will be out of reach for this little IP camera. You can access the security cam through both iOS and Android smartphones – bringing along great usability no matter the phone you’re using. By supporting motion detection, this security cam is capable of sending out alarm messages whenever it has detected movement. Besides sending out a message to your phone, it will also start recording instantly. This footage will be stored onto its 32GB SD card and can be used as future evidence. With Dual-Way Audio in place, this IP camera lets you talk to whoever is in your home. This provides you with a way to let intruders know they are being watched and recorded. Your security gadget furthermore comes with IR cut and 5m night vision. It will treat you to highly detailed images at both day and night. This IP cam comes with a 12 months warranty, brought to you by the leader in electronic devices as well as wholesale electronic gadgets..